(CNN) - A ranking Justice Department official named by Republicans in their probes into the botched gunrunning scheme "Fast and Furious" will resign on Friday, Attorney General Eric Holder announced in a statement late Monday. Gary Grindler is Holder's chief of staff and has held a number of other positions, including as acting deputy attorney general. His office oversaw the Bureau of Alcohol, Tobacco, Firearms and Explosives, which led the program that allowed hundreds of illegally purchased weapons into the hands of Mexican cartels as a way of tracking their movements. But methods for tracking the weapons disintegrated, and missing weapon turned up at the site where a U.S. Border Patrol agent was killed in 2010. Grindler was named in a report by Rep. Darrell Issa's House Oversight Committee which was critical of several senior Justice officials for failure of oversight on the program. Shortly after the report was released, Deputy Assistant Attorney General Jason Weinstein stepped down, as have other Justice and ATF officials associated with the operation. The Justice Department's inspector general issued a separate report recommending disciplinary action for 14 officials including Grindler, but no criminal sanctions. According to the inspector general's report, Grindler was told of the link between "Fast and Furious" and the killing of Border Patrol Agent Brian Terry in December 2010, shortly after the shooting, and "should have informed the Attorney General as well as made an appropriate inquiry of ATF or the U.S. Attorney's Office about the connection." The House committee report characterized Grindler's "passive management style" and said he "did not take an active leadership role with respect to ATF." "Grindler received detailed information about the connection" between "Fast and Furious" and the death of Terry, Issa's report found. "He took no action, however, to investigate the operation." The inspector general report found Grindler "should have informed the Attorney General as well as made an appropriate inquiry of ATF or the U.S. Attorney's Office about the connection." Holder's Monday statement made no mention of "Fast and Furious" but did note Grindler's role in negotiating a $4 billion settlement with BP over the 2010 Gulf of Mexico oil spill. "Throughout his tenure - as Acting Deputy Attorney General and as my chief of staff - Gary has played a central role in our work to protect the American people and I will always be grateful for his dedication to the Department, his service to our Nation, and his sound advice and personal friendship," Holder wrote. "He has demonstrated time and again his good judgment and an ability to make the tough - and correct - decisions. I cannot imagine the Department without Gary, though I wish him all the best as he considers opportunities in the private sector – and I know that his extraordinary contributions will continue to guide our efforts." Grindler was appointed chief of staff in January 2011 and had also served in President Bill Clinton's Justice Department. The current deputy chief of staff will fill his role, the statement said. Obama (no see) Holder(no hear) Grindler (no tell) Grindler takes the fall to protect the administration. To bad he didn't turn states evidence instead of blemishing his career. But the Obama administration will make sure he is taken care of for this great service and dedication to the administration. OK , is Darrell Edward Issa happy now ? It is a step in the right direction. But the real criminal and incompetent is still in place as AG. 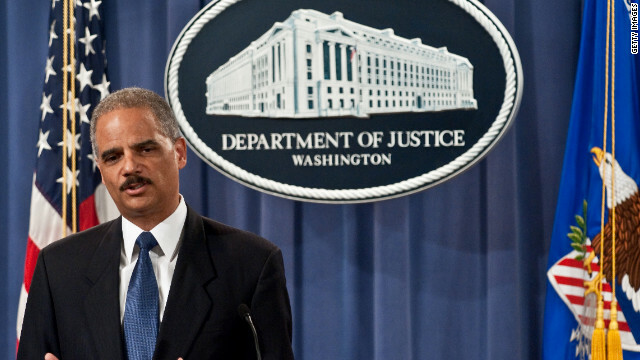 Eric Holder should resign or be impeached! The perfect scapegoat, a laid back hands off kind of a guy who chose to stay out of the loop. Just the type for a federal law enforcement agency. I voted for President Obama in both elections. I have not liked Holder since the Arizona Immigration laws were signed by the governor; when asked for his opinion, Holder responded "I haven't read it." I think it is important for the Attorney General of the United States of America to be familiar with nearly revolutionary legislation passed in the States. I would not cry bitter tears if Holder resigned. My tears would be a different kind. "I" will fight for you !!! Well "I" might have to toss you overboard to protect "MYSELF"
Holder, himself, is the real problem. The public has no idea of the things going on, in the DOJ, and they really should be more informed, but the media hides the truth from them.